That’s a heartening number of us who can think for ourselves, and it’s due in a large part to the availability of real facts on the internet. The goons repeating press releases and spin lines as journalism,simultaneously on FTA TV channels,as their “news” and our Aussie Bolshevik Collective’s barracking for the left, must be believed by only the few who have cobwebs where grey matter should reside! Factual information from the internet may disappear. 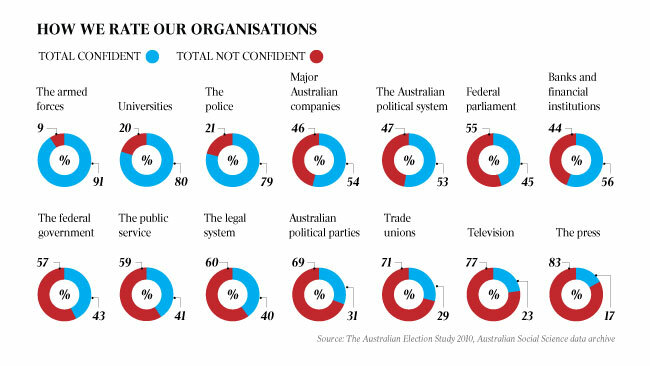 I find it interesting that people rate the armed forces and police so high yet public service so low. Are people not aware that these people are in sections within the public service.